In this revealing booklet Prokofieff presents startling new research, which at the very least shows the above hypothesis to be misguided. His key evidence is the text of a letter, reproduced in its entirety, handwritten by Tomberg in 1970, which demonstrates the full extent of his condemnation and dismissal of his former spiritual path and teacher. SERGEI O. PROKOFIEFF was born in Moscow in 1954, and studied painting and art history at the Moscow School of Art. He encountered anthroposophy in his youth, and soon made the decision to devote his life to it. For years he has been active as a lecturer and author. 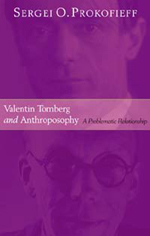 In 1991 he became a co-founder of the Anthroposophical Society in Russia, and since Easter 2001 has been a member of the Executive Council of the General Anthroposophical Society in Dornach. Sixteen of his books are currently published in English translation, including his latest major work May Human Beings Hear It!